Your backbone is connected to your hipbone, and your hipbone is connected to your thighbone, so it goes with saying that the pain and discomfort caused by various traumas to your body (see list below) will be connected as well. That's why our Comfort Cushion was designed with you in mind - to help those suffering from tailbone discomfort, lower back pain, surgical stress, and body trauma. The cushion was made to provide comfortable and stress-free sitting. It supports the pelvic and lumbar regions, thus reducing the fatigue caused by prolonged sitting. "Our Comfort Cushion was designed with you in mind!" "Our cushion was made to provide comfortable and stress-free sitting!" VERSATILE USE: Our coccyx orthopedic comfort seat cushion provides superior relief. This inflatable seat cushion can be used for your office chair, car seat, desk chair, airplane seat, rocking chairs, sitting chair and wheelchairs. It is also the best donut pillow for hemorrhoids and related issues. COMFORTABLE CUSHIONING: Our doughnut pillow is a machine washable seat cushion that has an anti-slip cloth cover, which makes this sitting pillow safe for most ergonomic office chair. 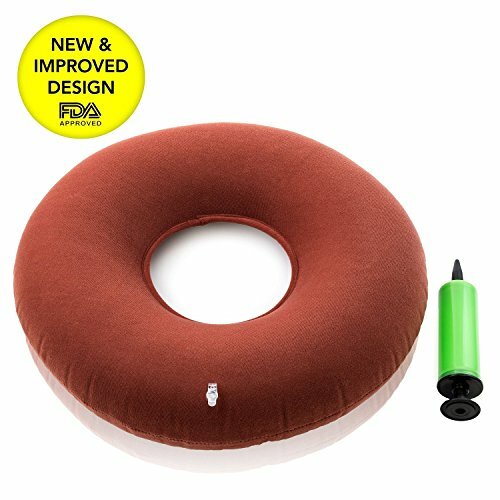 This inflatable donut cushion also offers quality cushioning, alleviating the pressure placed on the coccyx. TAILORED COMFORT: Our EMS orthopedic seat cushion's level of inflation can be adjusted to meet your individual needs and provides ideal lumbar support for office chair and other sitting areas. It is shaped like a ring cushion so that users can find relief from their tailbone and spinal pain. MULTIPLE FUNCTIONS: Our coccyx seat cushion or "tush cush" as it's known, is a coxis pillow for hemorrhoids; donut pillow for pregnancy; donut pillow for coccyx discomfort; donut cushion for tailbone; and medical donut cushion. VARIED NEEDS: Our aylio seat cushion can be also used as an ergonomic chair cushion, wheelchair cushion, orthopedic seat cushion, bed sores cushion, hemorrhoid pillow, tailbone cushion, and elderly sitting cushion, depending on our customers' specific needs. If you have any questions about this product by EMS Extend Medical Supply, contact us by completing and submitting the form below. If you are looking for a specif part number, please include it with your message.